Indian Pharma CRAMS sector valued at $8.2 Billion with 41.4% growth trajectory, Set To Triplicate global average of 12.6% Reviewed by PHARMALEADERS on February 12, 2013 . Sunday, 12th Augst 2012, Mumbai, Maharashtra : 5th Annual Pharmaceutical Leadership Summit & Business Leadership Awards 2012 ( www.asiapharmaleaders.com ) coinciding with the Summit Theme “Brand India Pharma” is getting its momentum in the healthcare space with the tremendous response in its voting for the coveted “India’s Most Promising Outsourcing Pharma Company in CRAMS Award 2012” with four leading players in its nominations. “Indian Outsourcing market has increased with great speed in comparison to global markets such US & China, primarily due to India’s big advantage in manufacturing & technology excellence with host of progressive companies in large sectors such as Aurobindo, Divi’s labs, Suven Life Sciences, Jubilant Life Sciences etc & the coming years will add more & more global Companies to the existing biggies client list as we are seeing the increase in medicine consumptions & Indian Pharma CRAMS sector valued at $8.2 Billion with 41.4% growth trajectory, Set To Triplicate global average of 12.6%” said Satya Brahma, Chairman of the Board at 5th Annual Pharmaceutical Leadership Summit & Awards 2012 organized by Pharmaleaders ( www.pharmaleaders.co.in ) in association with Pharmexcil, Ministry of Industry & Commerce, Government of India & many leading trade bodies. Rising at current 41.4% , the speed of growth is estimated to be more than thrice the global average of 12.6% CAGR in the outsourcing market worldwide. Shaping the global outsourcing industry including declining revenues from new drugs, increasing role of generics, pricing pressures are propelling this leading low-cost location to the center-stage. Indian CRAMS players see several other factors working in favor catapulting them to the high growth trajectory.CMOs in India continue to be the big-time favorites of some global majors looking to get some of their non-core activities outsourced to the third parties. The Four Players who are in competition with the coveted Awards are Akums Drugs & Pharmaceuticals, Rusan Pharma, Medreich & Neuland Laboratories. 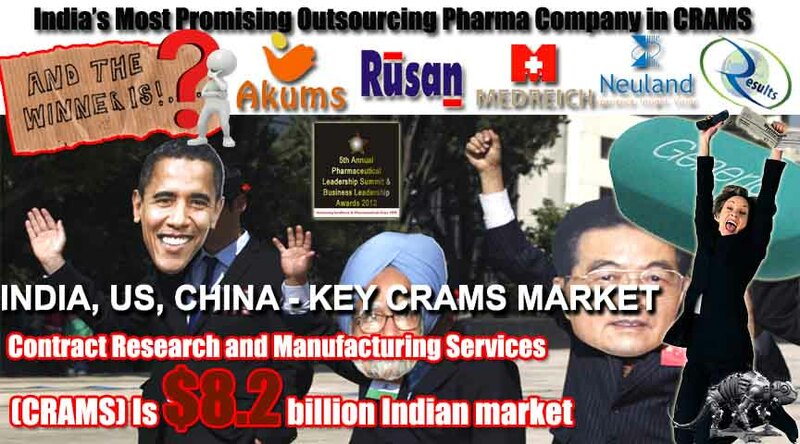 Akums Drugs & Pharmaceuticals, headquarted in Delhi is one of the most proimising Pharmaceutical Contract Manufacturing Company with a total group turnover of more than 800 Crore. Akums manufacture most of the top brands of leading pharmaceutical companies of the country published by ORG (Operational Research Group).Akums has acquired/possess brands of Wisdom, Mankind, Plethico, Core, May & Baker, & Others. Companies such as Sanofi-Aventis, Wockhardt, Micro, Shreya Life Sciences, Nicholas Piramal, Alembic, Emcure, Modi-Mundi, Sun Pharma, Zydus Cadila, Alkem, Intas, Lupin, Torrent, Blue Cross, FDC, TTK Healthcare, Flaminga, Indoco, Win Medicare, Panacia have een engaged withAKUMS either on principal to Principal or Loan Licence basis for their domestic as well as export requirements. Rusan Pharma has has a strong domestic as well as international presence & is facilities have accreditions from UK MHRA, South Africa –MCC , WHO-GMP approvals and is in the process of getting US FDA to target US and European market in an aggressive manner.Reckitt Benckiser, Novartis, Ratio Pharm, Arrow, Dr. Reddy’s, Glenmark, Alembic, Genesis, LPC, Relon Chem, Goldshield, Scriptpharm, Dezzo, Pharmachem, Manx Healthcare etc. Much Awaited 3rd Annual Pharmaceutical Leadership Summit 2010 to be staged in Mumbai.